Turkey has proven to be a high-protein and nutrient rich food. It is high in both vitamins B3 and B6 while still being a lean protein source. With no known allergies, hemp is one of the most nutritious seeds in the world – A true superfood! Omega oils can help alleviate skin issues. Pinto beans are known as a highly nutritious food to support food sensitivities. Also considered a world superfood, coconut provides your dog with immediate energy while aiding in digestion and joint health. It too promotes a shinier coat. Filled with powerful antioxidants, kale is also rich in vitamins K, C and A. It is high in iron and has more calcium than milk making it important for strong bones. Turmeric is an ancient spice that has been known to aid digestive, joint, and skin health. As a natural source of antioxidants, such as vitamins C and E, blueberries help your dog’s immune system. Pumpkin is low in saturated fat, sodium and cholesterol. It is also a good source of Vitamin E, magnesium, phosphorus and potassium and is also a very good source of dietary fiber. Turkey, Pinto Beans, Hemp Hearts, Carrots, Coconut, Pumpkin, Kale, Blueberries, Turmeric, Vitamin A Supplement, Vitamin D3 Supplement, Vitamin E Supplement, Niacin Supplement, Iron Proteinate, Calcium Carbonate, Phosphorous, Zinc Proteinate, Riboflavin Supplement, Thiamine Mononitrate, Potassium Chloride, Manganese Proteinate, Copper Proteinate, Magnesium Chloride, Pyridoxine Hydrochloride, Vitamin B12 Supplement. Our gentle freeze-drying process removes 92% of the water contained in our ingredients, leaving a food that is lightweight, compact, shelf-stable and preservative-free. Preparing our food is easy and takes just minutes. Simply add water, mix, and serve after 5 minutes. For each cup (113g) of Grandma Lucy's add 1 - 2 cups (240 - 480mL) of warm water. Stir well and let stand for 5 minutes. After 5 minutes, food may be served. Leftover food can be refrigerated for up to 48 hours. Our diets are easy to prepare and will keep your kitchen mess free! Simply scoop out the appropriate amount for your pup according to our guidelines, add water, stir, and wait 3-5 minutes for full rehydration. Add desired protein on our Pre-Mix diets. Enjoy! Grandma Lucy’s Macanna Turkey Recipe is formulated to meet the nutritional levels established by the AAFCO Dog Food Nutrient Profiles for All Life Stages. The suggested daily amounts are guidelines and should be adjusted to suit your own dog’s unique nutritional requirements, which may vary according to age, level of activity, genetics and environment. Keep fresh water available at all times. Store in a cool, dry place. DID YOU KNOW WE HAVE A FREQUENT DINER PROGRAM? Buy 12 bags and get the 13th bag Free! At Grandma Lucy's we use the finest ingredients from trusted suppliers around the world. 87% of our ingredients are sourced domestically and we take great pride in supporting local restaurant suppliers in California. Our high standards and expectations will give you confidence that you are getting the best quality ingredients and products offered. To learn more about Grandma Lucy's ingredient sourcing click our ingredients map. Grandma Lucy’s believes that healthy food should not only be good for you, but taste good as well. We have taken many of Mother Nature’s delicious superfoods and blended them in a way to bring your dog a diet that is highly nutritious, filled with whole ingredients they will love. Superfoods such as hemp hearts, coconut, kale, and turmeric are some of the easiest and best ways of increasing your pet’s nutrient intake through food. 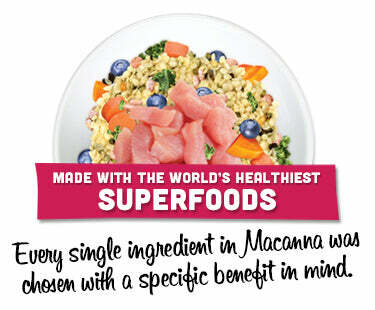 Every single ingredient in MACANNA was chosen with a specific benefit in mind. Hemp Hearts are rich in Omegas 6 and 3 to help give your pets a shiny coat. Coconut is a nutritional powerhouse filled with heart healthy antioxidants, vitamins and minerals. Kale is one of the most nutrient dense foods on the planet that is also high in antioxidants, fiber, and folic acid to help promote a healthy heart, skin, bones, and eyes. Turmeric is an ancient spice that has been known for many health benefits such as its anti-inflammatory properties and its help in maintaining a healthy digestive system, skin, and joints. All of these superfoods together make a food filled with benefits so your dog can eat their way to health. Since the water and oxygen have been removed from freeze-dried food it does not require refrigeration when stored and is safe to store at room temperature for long periods of time. Once water is removed the weight of the freeze-dried food can be reduced by as much as 80%. Freeze-dried foods are moisture sensitive and rehydrate in minutes. Freeze-drying uses low levels of heat so most food closely retains the taste, texture and aroma of it’s fresh counterpart. Our legumes, potatoes, hemp and quinoa undergo a propriety process to create a highly nutritious flake. This distinct process protects the nutritious integrity of these whole foods while still allowing for a quick rehydration time. Once water is added back to the food, the result is a soft flake with texture and nutrition pets love.